If any further convincing is needed, in order to show that Fidesz has morphed into Jobbik, then the words of Hungary’s Minister of Justice, shared by Inforádió Friday morning, should suffice. László Trócsányi started off by attacking the European Union’s system of quotas when it comes to accepting and assigning refugee claimants among the member states. He then added that Hungary was already dealing with a huge influx of refugees, in significant part from Kosovo, noting that for Hungary the Balkans represented a priority and a problem, rather than the Mediterranean. He then explained why the Orbán government had no choice, but to say ‘no’ to more immigrants and refugees: Hungary can’t accept any more economic migrants, because it must tend to the integration of 800,000 Gypsies. In other words, the Roma pose too big of a problem and the Orbán government’s hands are already full with them. László Trócsányi, Hungary’s openly racist Minister of Justice. The liberal 444.hu website noted that the debate on immigration has “reached new heights,” observing sarcastically that Mr. Trócsányi was a “genius” for connecting the issue of immigration with the Roma minority. The paper remarked that perhaps rather than suggesting that the Gypsies are to blame for Hungary not being able to support a compassionate immigration policy, one might consider that a whole slew of unnecessary soccer stadiums built by Mr. Orbán’s government and his friends or the massive corruption that permeates the government is the reason why there is no money, resources or energy remaining to accept refugee claimants. Dialogue for Hungary (Párbeszéd Magyarországért – PM), a small opposition green party, is already demanding that Mr. Trócsányi resign. The party’s spokesperson, Rebeka Szabó, said it was infuriating that the Minister of Justice would speak of the entire Roma minority as a burden for Hungary. The Hungarian Liberal Party joined in the calls for Mr. Trócsányi’s resignation, adding that it is totally unacceptable for a government minister to judge Hungarians based on their ethnic or racial origins. I should note that Mr. Trócsányi visited Canada this past March, where he came to negotiate with Stephen Harper’s government on “the regulation of migration” and, since Hungary has taken over the chair of the International Holocaust Remembrance Alliance (IHRA), to open the commemorations hosted by the Embassy of Hungary in Ottawa. Hungary’s participation in the IHRA clearly hasn’t made the Orbán government any more sensitive to issues of minority rights and anti-racism. I continue to believe that it is shameful, how the Government of Canada has turned a blind eye (more so than any of its partners), to the true nature of the Orbán regime. Yes but a small detail seems to have slipped past László Trócsányi? 100% citizens of Hungary, 100% a minority of Hungarians. 100% citizens who should be integrated 100% in society instead of being marginalised. 100% Hungarian who should be sharing in education resources instead of being ghettoised on the ground floor of schools and benefitting from the resources available to the non-Roma upstairs. This is another manifestation of how Orban thinks – where others vicariously act under tacit instruction. They are not told what to do… they know instinctively. We are trying to integrate them for 600 years – with no visible success. You couldn’t be lying more! First of all, most were integrated during communism, I know this because I am the offspring of integrated Roma, they speak Hungarian and always have, and absolutely identified themselves as Hungarian. After the fall of communism people decided free speech meant they can now freely discriminate and mistreat and push Roma to the outskirts of society once more. This is why they do not feel as though they are Hungarian anymore. It pisses me off to no end because the government along side the racist people of Hungary are once again referring to and treating them like they are not only second class citizens in their own country but call them immigrants as well. What some people do not care about and constantly make excuses for is the fact that you cannot expect people to feel integrated nor want to be a part of a country that treats them that way. Excluding them from mainstream society then complain they don’t want to integrate. Oh he of pure Magjardom! They pay taxes in Hungary. They receive social security as Hungarian citizens. They attend school in Hungary. They require a passport to leave and return to Hungary. They are Hungarians. Hungarian, Hungarian, Hungarian. Imagine how divided England would be if we took the same attitude to all our ethnic minorities? No one would be English. The problem is the Hungarians in Hungary. Charlie, nice try yourself – calling a people in their own land a ‘problem’ because they don’t feel the need to take in countless refugees and immigrants that do not share their values – and, often, for no good reason. To say an other example: Palestinians with Israeli citizenship =/= jews. László is right you brainwashed left liberal zombies! If you are Chinese you would have a Chinese passport. If you were ‘Atilla Vipera’ you would have a Hungarian passport and probably a visa to work in China. Hungarian citizens, of whom Hungarian Roma are a subset, are Hungarians with a Hungarian passport if they dare to leave the country. In England Jamaicans who came over in the 60’s are Jamaican unless they took out British citizenship. Their children born in this country are British – unless they want to become Jamaicans and renounce their British citizenship. Many have dual nationality. Romanians, Slovaks, Serbs, Ruthenians, Germans, Slovenes, Jews, Croats….. Many Hungarians with these ancestries are still Hungarian – if they live in Hungary and declare themselves Hungarian.. So much for Majgar ‘purity’ ! To László, George, Viper and Géza……. 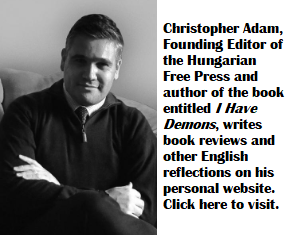 You vividly demonstrate why Hungary is – and will be for many years – a divided society. This is the nub of the issue – and is permeated right through to the top of Hungarian society. I know – when I’m in Hungary I get doses of this daily.